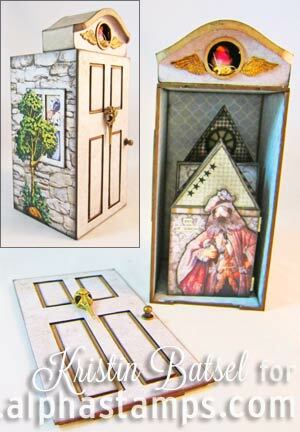 This Odd Houses Add-On Kit is related to the main February Little House Kit (and to the Mad, Mad, Mad House Swap — and even if you're viewing this page after the swap is over, there's still inspiring artwork on that swap page). And finally, Decorative Windows Set 1:24! Adorable little windows, each about 1" wide (4 shapes and each has a matching frame to give it dimension, so 8 pieces). While I'm explaining all these components, everything in this add-on kit is also available to buy separately (until sold out). See the "We Also Recommend" section, below, for links/pics. But... the whole point of these goodies being in a kit (well, maybe two points): you can buy them all with one click AND they are at a discounted price! Even considering the sale prices (as everything in the kit has just been put On Sale! ), if you buy all these items individually it would cost $31.39. Time to Shop by Caroline Ouzts-Hay. See the Supply List. For more information see the blog. Birds of a Feather Row Houses by Kristin Batsel. See the Supply List. More artwork in the Odd Little Houses Gallery. This product was added to our catalog on Friday 29 January, 2016. Phone orders are not accepted. Please place your order via the Web site shopping cart.